By: Louise Lynch, Pub. 1992, 178 pages, soft cover, Index, ISBN #0-89308-472-7. 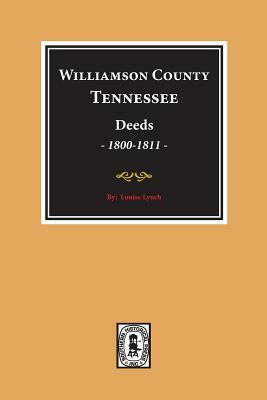 Williamson County was formed in 1799 from Davidson County, and until 1804 it extended to the Alabama line. Later counties cut out of this original Williamson County were: Bedford, Lincoln, Marshall, Maury, Rutherford, and Giles. These books contains over 20,500 persons mentioned in these deeds. People who were buying and selling these lands were scattered everywhere, with some persons living in GA., Mississippi Territory, NC, VA., KY., and PA. Publisher: Southern Historical Press, Inc.